Going minimalistic... I've sold more than 30bags full of clothes, shoes and accessories. The closet has been cleaned out 'till the last pair of socks, and I finally accepted the pieces that are fitting me the best: black, minimalistic prints like stripes, white, camel, khaki, marine blue,... Okay, it probably sounds very boring, or 'typical' blogger-ish. But at the end; I feel great in it and other people are happy with the bags of clothes they got! Win-win-situation if you ask me. 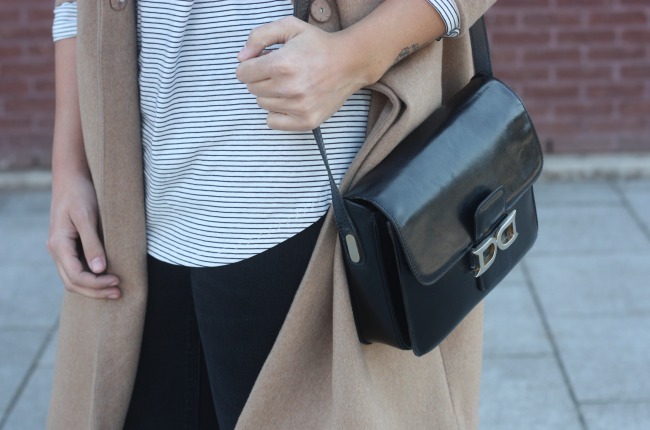 For me, by a minimalistic look, you need the perfect bag. Also one that fits your style the best, and one that you can still use within a couple of years; a classic. Like shown yesterday; I got myself the Delvaux cross bag and I'm so happy with it! It completes my looks, style. Yay! In what kind of clothes do you feel the best?